The advances in a firefighter’s personal protective gear and safety aparatus is amazing. Back in 1896, firefighters did their jobs in their personal work clothes. As seen in this 1917 photo at left, the gear was soon upgraded, to that of a rain coat and metal helmet. 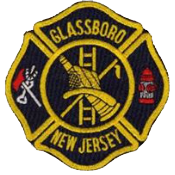 As years progressed, so did the “turnout gear.” To day, Glassboro’s firefighters are provided the best possible personal protective equipment (PPE). This equipment consists of a turnout coat, turnout or bunker pants, boots, protective nomex hood, helmet, and self contained breathing apparatus (SCBA). Also, firefighters now have technology at their disposal with such equipment as PASS safety devices, capable of alerting others of a downed firefighter, and thermal imaging capabilities.